There are lots of elements to choosing a managed hosting provider. But even if the hoster has nine out of 10 of your most important elements pegged, bad performance could crush your hopes. For those interested in real performance numbers, you can thank Cloud Spectator for running benchmarks. But the one who should really be thankful is HOSTING, the managed hoster that came out on top. So who exactly did HOSTING outshine? How about Rackspace (News - Alert) and Amazon AWS? Linux was another area to shine, and here HOSTING has 70 percent better performance than the two giants. HOSTING came out on top for overall performance, as well as for CPU, storage and network functions. Cloud Spectator is no flash in the pan. The company watches 20 different IaaS providers every day, tracking and continually monitoring performance in the areas of CPU, storage, RAM and the performance of the provider’s internal network. In fact, Cloud Spectator runs these tests at least three times a day, every day. The benchmark for HOSTING took 20 days and compared HOSTING Cloud Enterprise, Amazon AWS and Rackspace OpenCloud. “HOSTING offers the fastest CPUs on average, as well as greater performance predictability. In a Windows environment, HOSTING consistently outperformed both Rackspace and Amazon over the entire test period. The aggregate performance differentials between the three providers for Linux systems show HOSTING CPUs outperforming Rackspace's CPUs by 10.1 percent and Amazon's by 49 percent,” the report said. HOSTING says this all comes from a bit of discipline. "HOSTING's superior performance is based on our disciplined architecture and operational rigor, employed to provide the best customer experience possible," said Art Zeile, CEO at HOSTING. As we mentioned, performance is of critical importance. But it is certainly not the only thing Gartner (News - Alert) looks at in putting together its recent Managed Hosting Magic Quadrant. HOSTING made the magic cut, placing in the lower left hand corner, which qualifies the company as a “niche player”. 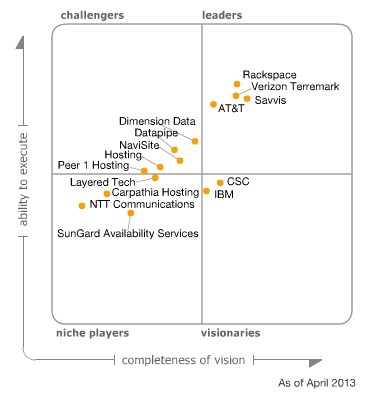 Rackspace was in the upper right hand quadrant as a leader, while AWS didn’t appear anywhere. So what precisely is managed hosting? For Gartner “managed hosting solutions are offered on physical and virtualized infrastructures, including cloud infrastructure as a service. This market is mature, but cloud capabilities are disruptive, so vendors must be chosen with care,” the report said. Furthermore, these services include storage, bandwidth, data center services and the provider must manage the computing, including managing server operating systems – that element of management of course is the key! These managed services can be provided in a number of ways; on dedicated physical servers, virtual servers, as infrastructure as a service (IaaS), or shared or multi-tenant infrastructure. Gartner analyzed vendors’ ability to provide enterprise application hosting such as handling SAP (News - Alert), e-business hosting including e-commerce and e-marketing, and Web-based business application hosting such as supporting corporate intranets. Gartner’s criteria is the product/service itself, quality of user experience, market understanding, product strategy and innovation. Gartner didn’t find a single perfect vendor. “Providers may be leaders in some areas but lag behind in others. As a result, it is important to match your use case with a vendor that excels in meeting your particular needs. Smaller providers may do one thing extraordinarily well, but may not have a comprehensive set of services that enables them to address a broad array of use cases,” Gartner explained. AT&T, Rackspace, Savvis and Verizon (News - Alert) Terremark make the top magic quadrant cut as leaders. AT&T ranked lowest of the four magic quadrant residents, by a small margin. Because AT&T (News - Alert) has been in the managed hosting game for a long time, it can handle complex needs. “It can also manage complex enterprise application hosting, in synergy with its application management business,” said Gartner, adding that AT&T clients are often unhappy with the way the provider processes billing. Gartner also praised Rackspace for its customer service and overall responsiveness. Finally Gartner said Rackspace has aggressive pricing. However, if you need fast throughout all the way to the West Coast of the U.S., Rackspace lacks infrastructure in that part of the country to guarantee high speeds. Savvis is another veteran of this space, and as a result “can handle extremely complex deals, including large-scale e-commerce and enterprise application hosting needs,” Gartner argued. Savvis also has a full set of offerings in the areas of middleware, application support, and the type of infrastructure it supports. However, Savvis has been buying up companies and this has blunted the company’s focus, Gartner believes. This company came about when Verizon bought Terremark two years ago. Both outfits already had managed hosting offerings which were essentially combined during the merger. For previous Terremark accounts, customer service has gotten better since the merger.